The most up-to-date information about the P.I.P.E. Trust Fund and its Purpose. P.I.P.E. was formed in 1980 to improve communications between labor and management, to explore joint approaches to problems and to prevent potential problems, to improve occupational safety and health and other working conditions. The P.I.P.E. Partnership is a 3-way partnership between Labor, Management, and the customer. We are the joint Labor and Management cooperation committee and trust fund for the unionized plumbing, piping and HVACR industries in Southern California. We are the vehicle through which union contractors and union pipe trades workers advance the industry. By becoming part of the P.I.P.E. partnership you gain the benefits provided, such as media support for affiliated unions & contractors through the development and distribution of audio and video content for training, marketing, education, and public relations. P.I.P.E. operates its own modern production facility to provide the P.I.P.E. Partnership with high quality media services. 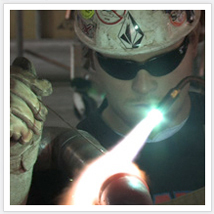 Go to Pipecareers.com to view our latest pipe career videos. Looking for a new Career in the Piping Industry? Acquire all necessary Certifications & Job Training. P.I.P.E. carries out an active role in political affairs. How P.I.P.E. reduces its environmental impact. P.I.P.E. participates in code & standards organizations. P.I.P.E. provides media support for affiliates. What is a green building? It might be better to ask what it is not. All of us, contractors and workers alike, have been constructing non-green buildings for over a century. Until recently that meant installing, maintaining and repairing systems whose only object was to meet a specification and satisfy a customer. In other words, to bring water, heat, and take away waste in the most efficient, safe, and economical manner. Doing this was, and remains, our business.